Charles Francois Armand de Maille de la Tour Landry, Duc de Maille married Henriette Victoire de Fitzjames, daughter of Jacques Charles de Fitzjames, Duc de FitzJames and Marie Claudine Silvie de Thiard de Bisey, on 23 August 1784. He died on 5 January 1837. He gained the title of Duc de Maille. Armand Paul Claude Charles de Maille de la Tour Landry was born on 25 January 1795. He was the son of Charles Francois Armand de Maille de la Tour Landry, Duc de Maille and Henriette Victoire de Fitzjames. He died on 18 May 1807 at age 12. Armand Roger Claude Hubert de Maille de la Tour Landry was born on 30 December 1799. He was the son of Charles Francois Armand de Maille de la Tour Landry, Duc de Maille and Henriette Victoire de Fitzjames. Claire Clemence Henriette Claudine de Maille de la Tour Landry was born on 9 December 1796. She was the daughter of Charles Francois Armand de Maille de la Tour Landry, Duc de Maille and Henriette Victoire de Fitzjames. She married Edmond Eugene Philippe Hercule de Croix, Duc de Castries on 28 October 1816. She died on 16 July 1861 at age 64. Her married name became de Croix. 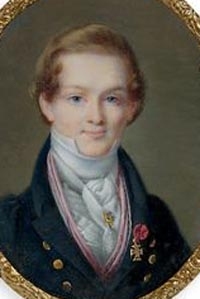 Edmond Eugene Philippe Hercule de Croix, Duc de Castries married Claire Clemence Henriette Claudine de Maille de la Tour Landry, daughter of Charles Francois Armand de Maille de la Tour Landry, Duc de Maille and Henriette Victoire de Fitzjames, on 28 October 1816. He died on 2 August 1866. He gained the title of Duc de Castries. Jacques Charles Rene de Fitzjames, Vicomte de Fitzjames was born on 16 July 1788 at Paris St.-LaurentG. He was the son of Jacques Charles de Fitzjames, Duc de FitzJames and Anne Bibiane Beauvaland. He married Helene Francoise Carmac on 26 January 1819 at Paris, FranceG. He died on 30 November 1834 at age 46 at Oron, FranceG. He gained the title of Viscomte de Fitzjames. Helene Francoise Carmac married Jacques Charles Rene de Fitzjames, Vicomte de Fitzjames, son of Jacques Charles de Fitzjames, Duc de FitzJames and Anne Bibiane Beauvaland, on 26 January 1819 at Paris, FranceG. She died on 12 September 1847. Her married name became de Fitzjames.